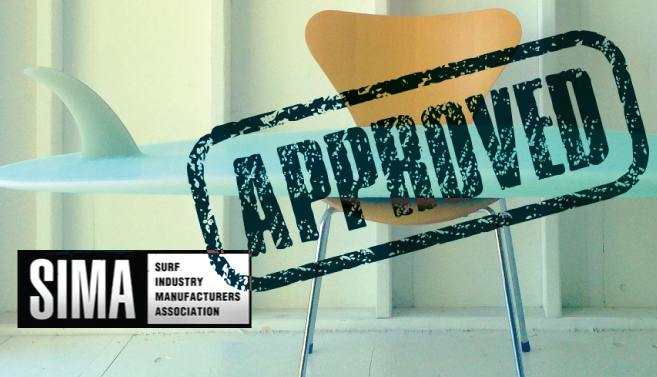 IT’S OFFICIAL FOLKS – SIMA (the Surf Industry Manufacturers Association) has endorsed the ECOBOARD Project as an innovative new resource for its Board Builder members to use. Ok, so what’s that mean? So for the for the few of you who didn’t attend the program’s recent launch party in San Fransisco – The ECOBOARD Project is a multifaceted program that ultimately helps surfers choose a high-performance sustainable surfboard made with a reduced environmental and toxic impact. The ECOBOARD Project provides the first, independent 3rd party “eco-label” for surfboards, that verifies the use of more sustainable materials made with the latest advancements in green chemistry, recycled and renewable materials. Materials…that have that have passed a science-based “Benchmark” for providing a significant reduction in environmental impacts, especially related to our oceans and waves. I don’t want to ruin the suspense, so check out the full Press Release below, as well as some of the cool pics of ECOBOARDS that are just starting to come out from top shapers and surfbrands that you already know and love including: Lost, Firewire, Channel Islands, T.Patterson, Stretch, Hobie and many more. And if you don’t see your favorite shaper on our list, tell them to sign up online here! ALISO VIEJO, Calif. (February 21, 2013) — The SIMA (Surf Industry Manufacturers Association) Board of Directors has officially endorsed the ECOBOARD Project, which provides a sustainable materials benchmark and helps bring clarity to the surfboard marketplace by verifying the use of more sustainable materials in surfboards. The ECOBOARD Project was developed by Sustainable Surf, a 501(c)(3) non-profit organization. The ECOBOARD Project helps consumers choose a high-performance sustainable surfboard made with a reduced environmental and toxic impact. The ECOBOARD label is the first, independent 3rd party, consumer facing “eco-label” for surfboards. It verifies the use of more sustainable materials in surfboards, made with the latest advancements in green chemistry, recycled and renewable materials. Alternative Structure: A surfboard structure made from sustainably sourced biological/renewable material (typically wood) that provides the majority of the surfboard’s material and structural integrity – and therefore significantly reduces the amount of foam or resin needed to build the board. The Benchmark uses science-based and transparent criteria to evaluate surfboard materials that are made with green chemistry, recycled content, or renewable materials. All material manufacturers are encouraged to develop new products that meet the requirements of the ECOBOARD Project Benchmark for materials. Many leading shapers and brands have already joined the ECOBOARD Project to offer more sustainable surfboards. Current participants include Channel Islands Surfboards, Firewire Surfboards, Lost Surfboards, Hobie Surfboards, T.Patterson Surfboards, Stretch Surfboards, Dewey Weber Surfboards, and more. Surfers who want an ECOBOARD Project labeled surfboard can find participating surfboard brands or shapers on the ECOBOARD Project website. Interested shapers and brands can sign up for the program via an online submission process which can also be found on the website. There is currently no cost for shapers/brands to join the program, as early funding for the ECOBOARD Project has been provided by charitable donations from several leading non-profit foundations. SIMA will be communicating information to its board builder members about the ECOBOARD Project in the coming months through a special section on www.sima.com <http://www.sima.com> and in SIMA’s Board Builder newsletter, Shapes. Stay tuned for information about a special Board Builder Boot Camp seminar as well. The Surf Industry Manufacturers Association (SIMA) is the official working trade association of more than 300 surf industry suppliers. Founded in 1989, SIMA is a non-profit organization that serves to promote awareness of the surf industry and participation in the sport of surfing through public relations efforts and a variety of services, educational programs and research. In addition, SIMA actively supports oceanic environmental efforts through its 501(c)(3) charitable environmental foundation, the SIMA Environmental Fund. In the past 23 years, SIMA’s Environmental Fund has raised more than $6.2 million for environmental groups seeking to protect the world’s oceans, beaches and waves. The SIMA Humanitarian Fund, also a 501(c)(3) charitable foundation, was established to award grants to various surf or boardsport related social and humanitarian non-profit organizations whose efforts are focused on improving the quality of life, health and/or welfare of people. Since 2004 the SIMA Humanitarian Fund has raised and donated more than $1.58 million to surf-related non-profit humanitarian organizations. For more information regarding SIMA, please visit www.sima.com. Follow SIMA at Twitter.com/SIMA_SURF. Sustainable Surf is a 501(c)(3) non-profit organization that engages surfing consumers with engaging environmental campaigns, that educate surfers about the lifestyle choices they can take to lower their impacts on the ocean environment. Sustainable Surf works in partnership with key players within the surfing industry to help implement these campaigns, to showcase how business can be an important driver toward solving the world’s environmental issues. Visit www.sustainablesurf.org <http://www.sustainablesurf.org> for more information about all our programs, including the ECOBOARD Project. Support for the ECOBOARD Project has been provided by charitable donations from foundations including the Quiksilver Foundation and the Mimi and Peter Haas Foundation.